· WiFi Controlled signal for iPhone (Open WiFi, search for CX-WIFIUFO and download it from App Store). 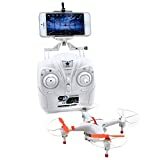 · With dual mode, you can use your iPhone and transmitter to control the Quadcopter to complete a series flight actions, such as UpDown, AceCondDescend, Turn Left Right, Left Right Sideware Flight, Suspended in the Air, 360 degree eversion and Tir-to-Fly. · 4-Channel RC Quadcopter with 6-Axis Gyro system, a premit your stable flight. · Come with a 0.3MP HD camera to record videos and take photos during the flight.